Did you know that the Alzheimer’s Association offers a service called Alzheimer’s Association TrialMatch® that assists people with Alzheimer’s disease and other forms of dementia, their families, and caregivers participate in clinical trials? TrialMatch®, which is available at no charge and is confidential, provides participants with comprehensive clinical trial information. As the name implies, the service matches people with Alzheimer’s disease and related forms of dementia with existing clinical studies. To date, TrialMatch® has matched more than 11,000 people to Alzheimer’s clinical trials based on their diagnosis, preferences, and location. TrialMatch® is easily accessible 24 hours a day at http://www.alz.org/trialmatch. TrialMatch Specialists are available via telephone at 800-272-3900, Monday-Friday, 8:00 a.m. – 8:00 p.m. Central time. The specialists at TrialMatch® will not recommend any particular clinical trial, but will describe all studies for which the person is eligible. They will answer questions about the trial process and connect individuals with trial sites based on their unique profiles. The Alzheimer’s Association created TrialMatch® because recruiting and retaining participants for clinical studies is one of the greatest obstacles to developing the next generation of Alzheimer treatments. Those with dementia diseases, as well as healthy individuals are needed for a variety of studies. The immediate need for advances in diagnosis, treatment and prevention has led to an unprecedented call for clinical study participants. Since the service launched in July 2010, more than 85,000 individuals have registered for Alzheimer’s clinical trials. Currently, Alzheimer’s Association TrialMatch® lists 250 research studies with 1000+ local trial sites nationwide. 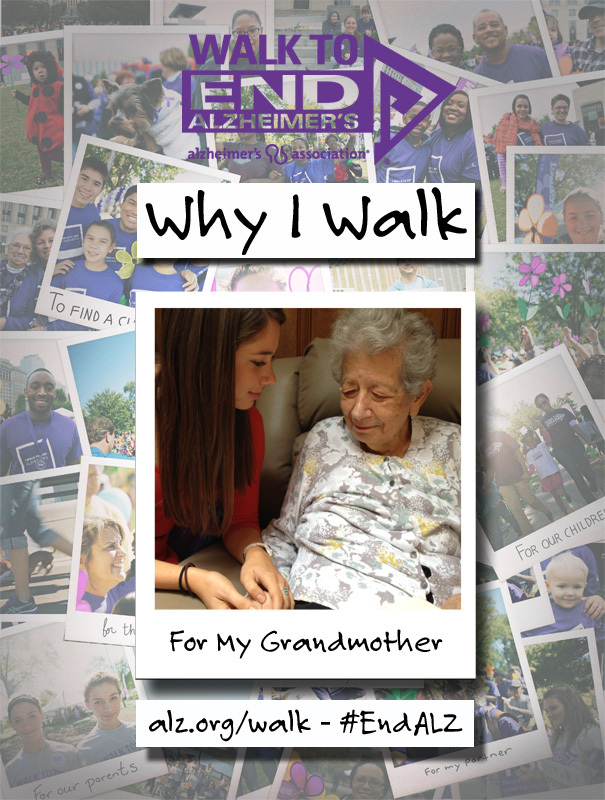 My name is Tessa Anderson, and I Walk to End Alzheimer’s for my grandmother, Theresa Zarbo. My name, Tessa, means little Theresa, and I am so proud to carry a little piece of my grandmother with me. She was truly a saint every single day—from the moment she was diagnosed to the day she slipped away. Theresa was the hardest working, most intelligent woman I have ever known. She graduated from high school at age 16 and went to Hunter College on a full ride in the 1940s. She was not only a dedicated mother, wife and teacher, but also an artist. We have her artwork all over our family home, from oil paintings to wicker baskets to beautiful afghans. My family connected as a unit to take care of my grandmother around the clock while she battled this insidious disease. I loved watching her light up while we colored with crayons or played with finger paints. Even though her motor skills were greatly impaired, she still enjoyed expressing herself through art. Alzheimer’s may have taken her brain, but it never stole her spirit. My grandmother never complained and was a courageous soldier throughout the stages of Alzheimer’s. I hope I have inherited her resilience. The Alzheimer’s Association 2015 Alzheimer’s Disease Facts and Figures report, released earlier this week, found that only 45 percent of people with Alzheimer’s disease or their caregivers say they were told the diagnosis by their doctor. In contrast, more than 90 percent of people with the four most common cancers (breast, colorectal, lung and prostate cancer) say they were told the diagnosis. “We can, and must do better,” added Baldwin. The Alzheimer’s Association 2015 Facts and Figures report also found that people with Alzheimer’s or their caregivers were more likely to say they were told the diagnosis by their doctor after the disease had become more advanced. According to the Association, this is a problem because learning the diagnosis later in the course of the progressive brain disease may mean the person’s capacity to participate in decision making about care plans, or legal and financial issues, may be diminished, and their ability to participate in research or fulfill lifelong plans may be limited. The 2015 Facts and Figures report provides an in-depth look at the prevalence, incidence, mortality and economic impact of Alzheimer’s disease and other dementias – all of which continue to rise at staggering rates as the American population ages. • According to the report, an estimated 5.3 million Americans have Alzheimer’s disease in 2015, including 130,000 Virginians. Barring the development of medical breakthroughs, the number of Americans with Alzheimer’s disease will rise to 13.8 million by 2050. • Almost half a million (approx. 473,000) people age 65 or older will develop Alzheimer’s in the U.S. in 2015. Every 67 seconds, someone in the U.S. develops Alzheimer’s. By mid-century, an American will develop the disease every 33 seconds. • Two-thirds (3.2 million) of Americans over age 65 with Alzheimer’s are women. • Alzheimer’s disease is the sixth-leading cause of death in the U.S., and the fifth-leading cause of death for those age 65 and older. • From 2000-2013, the number of Alzheimer’s deaths increased 71 percent, while deaths from other major diseases decreased. • Heart disease deaths decreased 14 percent; stroke deaths, 23 percent; HIV deaths, 52 percent; prostate cancer deaths, 11 percent; and breast cancer deaths, 2 percent. • Alzheimer’s is the costliest disease to society. Total 2015 payments for caring for those with Alzheimer’s and other dementias are estimated at $226 billion, of which $153 billion is the cost to Medicare and Medicaid alone. • Total payments for health care, long-term care and hospice for people with Alzheimer’s and other dementias are projected to increase to more than $1 trillion in 2050 (in current dollars). • In 2014, the 15.7 million family and other unpaid caregivers of people with Alzheimer’s disease and other dementias provided an estimated 17.9 billion hours of unpaid care, a contribution to the nation valued at $217.7 billion (with care valued at $12.17 per hour). • There are 452,000 Alzheimer’s caregivers in Virginia providing 514,000,000 hours of unpaid care valued at $6,259,000,000. Full text of the Alzheimer’s Association 2015 Alzheimer’s Disease Facts and Figures report can be viewed at http://www.alz.org/facts.